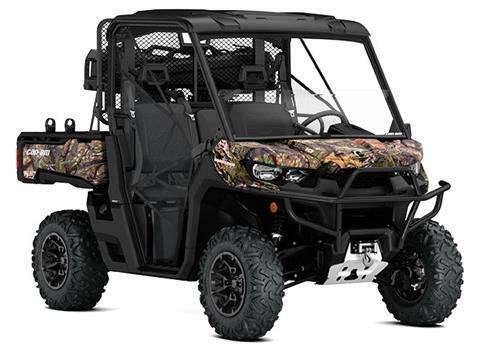 The Defender Mossy Oak Hunting Edition comes equipped with many factory-installed accessories including 27 in. (68.6 cm) Maxxis Bighorn 2.0 tires mounted on 14 in. (35.6 cm) wheels and Dynamic Power Steering for better handling and steering. SUPERIOR PROTECTION: Heavy-duty front bumper for a beefier look and functionality. The headache rack and full underbody skid plate with front aluminum pre-runner skid plate create an extra layer of protection for the occupants and the vehicle. The side mirror allows for extra visibility while the portable RAM LED spotlight comes in handy to bring home your trophy. ADVANCED VERSA-PRO BENCH SEAT: The VERSA-PRO bench seat offered on the Mossy Oak Hunting Edition package includes a reinforced seat cover. It uses a thicker vinyl and a special material finish to be more resistant and offer a premium look. The Defender vehicles’ high-quality seat cover is designed to endure the everyday use on the farm, job site and trail. In addition, the VERSA-PRO bench seat comes with a 3 in. (8 cm) adjustable driver’s seat (forward/rearward) for added comfort and better ingress/egress. 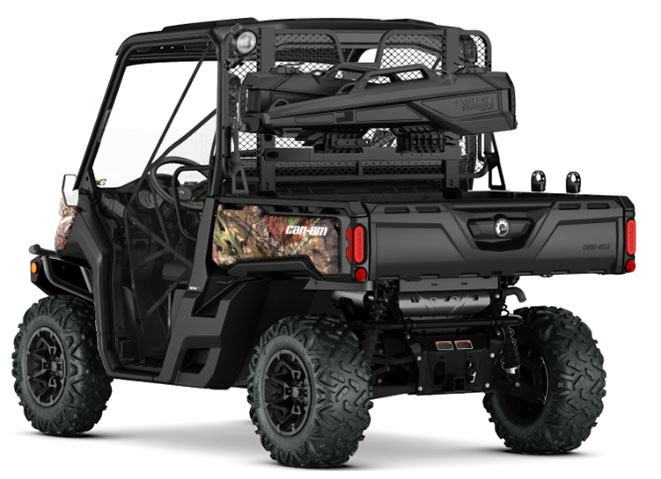 POWERFUL WINCH: Can-Am chose a premium winch kit for the ultimate performance and durability. The 4,500 lb. winch includes dash control and roller fairlead. LARGEST HOLDING CAPACITY: The Double Kolpin Stronghold Gun Boots features the largest holding capacity of all Kolpin Gun Boot cases while the removable foam and nylon Impact liner ensure a superior interior protection. Easily fits firearms up to 52 in. (132,1 cm) in total length with room for optics and bipods. Secures to mount in seconds with auto-latch feature. The holders are durable, flexible grips and cushion padded to protect while providing a custom fit for a variety of items 1 in. to 4 in. (2.5 cm to 10 cm). EXCLUSIVE: When it comes to concealment, nothing compares to the exclusive Mossy Oak Break-Up Country camouflage. The highly durable water-dipped camo finish is more resistant to scratching, mineral deposits and sun fading. More importantly, it lets hunters match their favorite camo manufacturer with their favorite SSV brand.